WHEELERVILLE, MISSOURI- The campaign to save a historic bridge in Missouri has kicked off with a fundraiser. 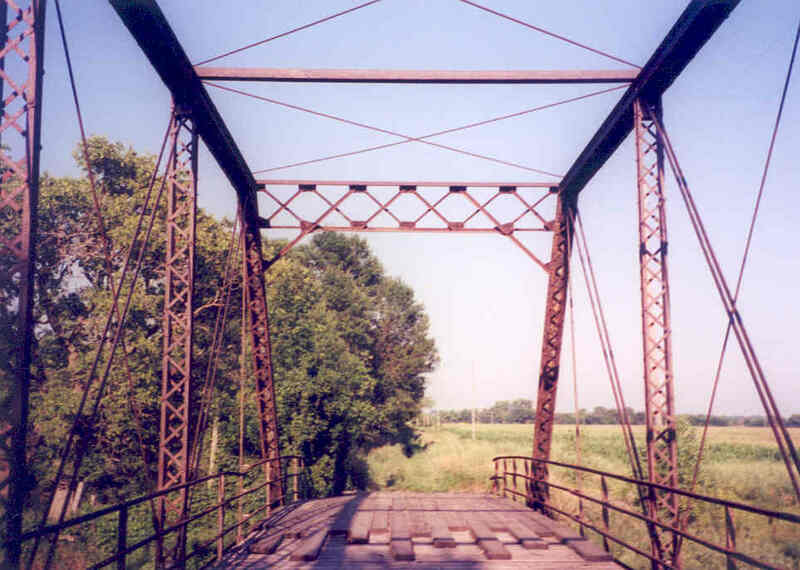 The Jenkins Bridge is a six-panel through truss bridge with M-frame portal bracings and pinned connections. 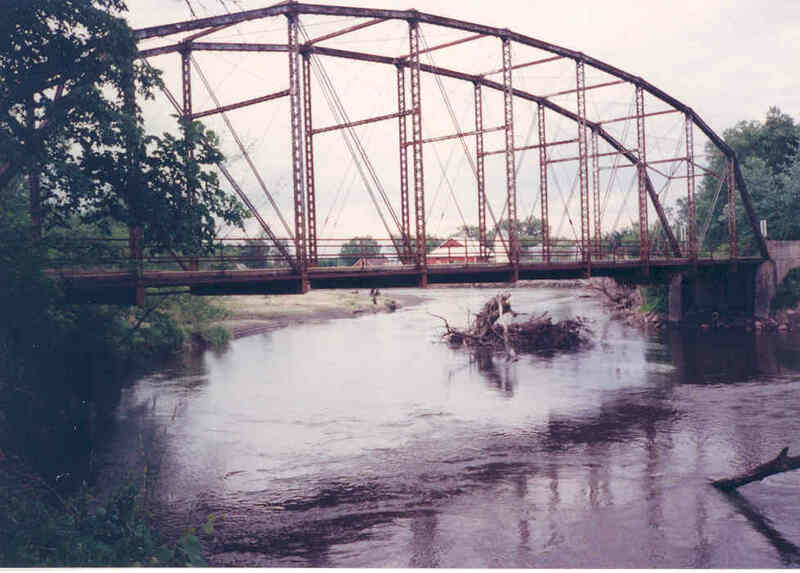 Spanning Flat Creek south of Jenkins in Barry County, this bridge was built in 1909 by the Standard Bridge Company in Omaha and has been a place of great memories by many locals who have used the bridge for swimming/ diving as well as fishing. The bridge has been closed since 2017 and many locals are working together with officials from Barry County to find a way to rehabilitate and reopen the bridge to traffic. Already at the starting block are the fundraisers that are underway. One of which takes place on Saturday, March 23rd. A benefit concert, featuring the music group, Homestead Pickers, will take place at the Wheelerville Church beginning at 7:00pm. Join them for an evening of bluegrass, gospel, country music with good ole fashioned humor and entertainment by the group featuring Greg Bailey, Greg Becker, Danny Eakin, and Walt Morrison. All proceeds from the concert will go towards the newly-formed Jenkins Bridge Foundation to file the necessary documents and restoration expenses of the bridge. Aside from restoring the bridge, the group is pursuing a plan to have the structure listed on the National Register of Historic Places. This will be the first of many fundraisers yet to come. More details on other plans for saving the bridge will come soon, as the Chronicles has been doing an e-mail interview with members of the group and will keep you posted on the latest. If you wish to contribute to the cause of saving and restoring the bridge, you may join the Jenkins Bridge Foundation’s facebook site, which you can click here. Grand Reopening of the 1882 Whipple Through Truss Bridge after a thorough Rehabilitation. 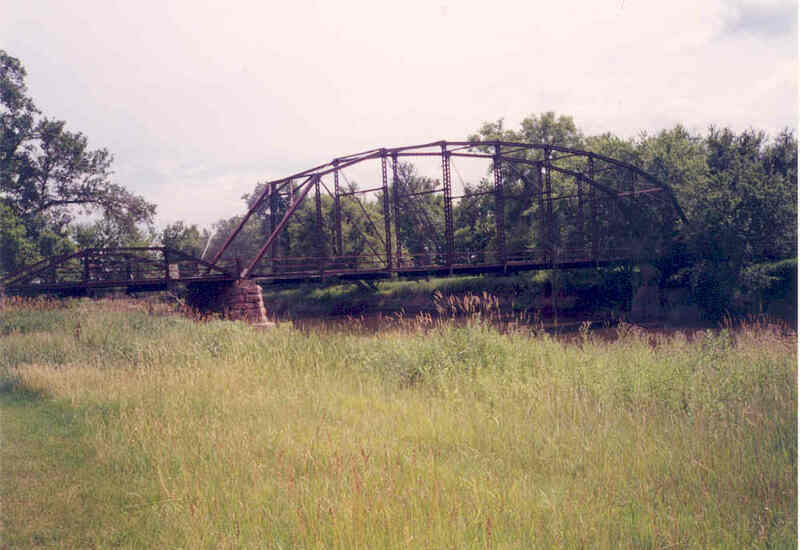 The Hayden Bridge was built by two Pennsylvania firms: Clark, Reeves and Co of Philadelphia and Phoenixville Bridge and Iron Works of Phoenixville. 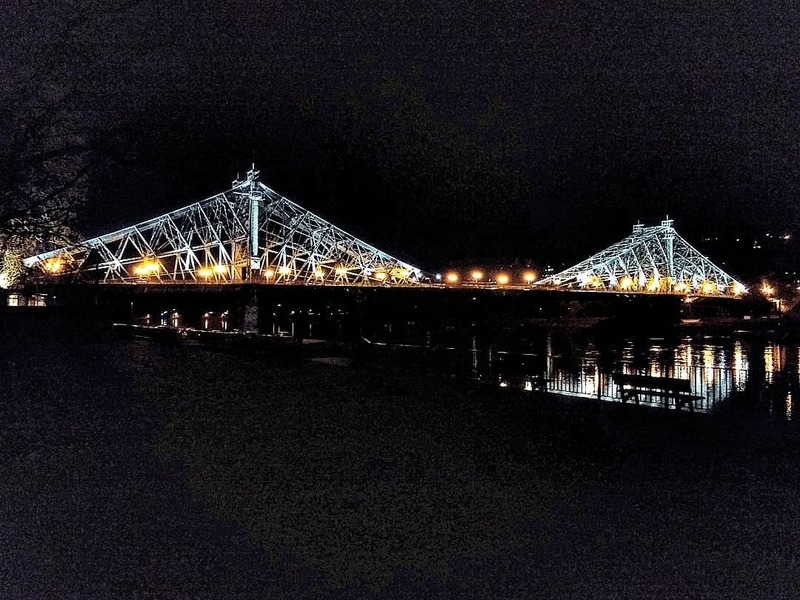 The 224-foot iron truss bridge features, pinned connections, ornamental decorations on its portal bracings and upper chord, as well as the octagonal Phoenix columns. The bridge used to serve the Weyerhauser Logging Railway but had originally been built in Corrine, Utah as part of a multiple-span crossing. It was relocated to its present spot in 1901 and served rail traffic until 1987. Details on the bridge can be found here. Springfield is located just east of Eugene in Lane County. Saving the Bockau Arch Bridge Day 11: A Flicker of Hope? This entry starts with a little bit of irony. The bridge was supposed to be torn down beginning the 14th after the organization Friends of the Bockau Arch Bridge was unable to purchase the historic stone arch bridge for 1.7 million Euros- a price that was considered too high and the figure to fictitious to anyone’s liking. Because of a massive snowstorm that brought life in Saxony and parts of Germany to a complete standstill, it was pushed back to the 21st. As of this entry and visit to the bridge on the 23rd, the old stone lady is still standing, with no digger, no crane, no driller, no construction worker. At temperatures well below zero Celsius, it makes the planned demolition impossible. And with more snow and cold in the forecast, chances are very likely that the planned work may not even commence until sometime before Easter. And that is a long ways away. However, this may be that window of opportunity that we need to turn it around and pull off an upset- a hat trick that is even bigger than the bunny the Ministry of Finance and Transport pulled. Already suggestions from nearby communities in Saxony indicate that people don’t want to part ways from this historic bridge just yet. In the newly consolidated Aue-Bad Schlema for example, there was a proposal to divert funding for renovating a club to go to purchasing and renovating the bridge. In Beiersfeld near Schwarzenberg, one official suggested at least leaving the bridge piers so that a wooden bridge is put in its place. If covered, it would be a first in over 150 years. And even in Berlin, the petition to save the bridge is being examined as the federal government still owns the bridge and the highway that crosses it, although it’s crossing a new bridge on a new alignment. So in other words, while the state is dead set on removing the structure, attempts to pull an upset is in the works. And as long as Old Man Winter hovers over the Ore Mountain region, there is still some hope to pull this off. We’re looking for any ideas to halt the demolition process. Rallies are possible, for we’ve seen this at many historic bridges in the US and Canada. Concerts as well. There is a possibility to donate to the group Friends of the Bockau Arch Bridge. But more importantly, we need some sources and people willing to step in and save a piece of history, one that can be used as a crossing for cyclists and pedestrians, fishermen and photographers, anybody who would rather see a piece of history in tact as is, and not in rubble. The old bridge has potential, and is stable enough for use. We need some ideas and your help…..
….as long as the snow is there and no green. A first in the Bockau Arch Bridge series since July and a lot has changed since then. It goes beyond the change in the color of the leaves in the fall, as you can see from the picture of the trees flanking the Zwickau Mulde from the old bridge. It goes beyond the fact that workers have poured the concrete on the new structure built adjacent to the old bridge. This was done in August and according to latest news from the Chemnitz Free Press, the new B-283 Bridge is scheduled to be open to traffic by Christmas, thus ending the detour of Highway B-283 between Aue and Eibenstock in the western part of the Ore Mountains, which has until now been rerouted through Zschorlau and Schneeberg. It has to do with a finding that was discovered during our most recent visit to the bridge and our Friends of the Bockau Arch Bridge Association Meeting on October 9th, something very unpleasant and will most certainly cause legal action because of the violations committed. Despite many headaches trying to download this clip from my camera, this 5-minute film tells all, even without the commentary in English…..
And after crossing the old bridge to get to the Bockau side of the span, we could see the “Schandfleck” in detail. A total “Schande” (shame) because of several reasons! 1. Since the bridge is still protected by the Denkmalschutzgesetz (German Culture Heritage Law), documentation of the structure will need to be carried out before its removal, which includes ist history, description and historical significance to the Region. If following the Guidelines that exist in the USA, that process could take 1-2 years to complete. 2. The Investigative Committee (Ausschuss), located in the state parliament in Dresden, which took on the petition to save the bridge back in March, has yet to decide on the bridge’s fate. At the present time, the association has three possible suitors that are willing to take ownership of the bridge once the new B-283 Bridge is completed. If Dresden says yes to the proposal, then the association has until March to name the suitor willing to take over ownership of the old bridge. If not, then the green light will have been given to proceed with the removal. 3. Even if Dresden says no, a copy of the Petition was forwarded to Berlin; specifically the Deutschen Bundestag (German Parliament) and the Deutsches Nationalkomitee für Denkmalschutz (Geman National Committee for Cultural Heritage), for the bridge carries a federal highway and if therefore responsible for the ownership of the bridge, which is still protected by the Cultural Heritage Laws (Denkmalschutzgesetz). That Petition has been accepted and the bridge is being considered for a program to protect places of interest, thus providing funding for restoring and repurposing the bridge. Having the concrete bed in the river, according to multiple choices may have violated these agreements and then some, for the Zwickau Mulde is protected by several natural preserve laws on both the state and federal levels. With the concrete bed in the water and despite the two pipes running underneath, it will have the potential to hinder the flow of fish flowing downstream, which could cause unrest from some of the local fisheries and fishing clubs along the river. Despite the need for having the bed there for the eventual removal of the old bridge, having the bed there is too early and could possibly cause some violations that could result in some legal actions. A gallery with pictures taken by the author will provide you with some Details. To summarize, the old bridge is still standing and can be crossed despite being partially blocked off. Yet the concrete bed indicates that workers want to go ahead and demolish the bridge before Christmas. The new bridge is almost completed and will open between November and December. The fate of the old bridge falls in the hands of both Berlin and Dresden, yet as the bridge is the ownerhship of the federal government, Berlin will have a say, yet if and how the old bridge can be saved is still open. There are interested parties in owning the bridge but the group cannot push forward until the government has a say in the whole debacle. And even if the group gets the go ahead, the decision of who owns it has to be made before spring 2019. And even then, funding will be needed to rehabilitate and restore the bridge. In other words, one has to happen after another in sequential order, yet some people are trying to make haste by putting the carriage before the horse- meaning tear the bridge down before the ownership transfership is approved and inspite of violations they make be committing. This mentality is clearly American and has been the target of comments by the German far-right party AfD to compare modernization in Saxony at the cost of historic places of interest to the works of the Taliban in Afghanistan. This commentary, albeit very harsh, is not far from the truth, and should the old Bockau Arch Bridge come down too prematurely, it may serve as a basis for more voters to flock to the AfD and for the current government in Saxony to topple come the state elections in 2019. If the party uses the slogan “Remember the Rechenhausbrücke!” similar to the Alamo in Texas, the people in Saxony will understand why. There are many ways to join the Friends of the Bockau Arch Bridge. To join and simply follow the page is as easy as clicking here and liking the page. But to really get involved and help out in saving and supporting the bridge financially and/or through other means, please contact Ulrike Kahl at this E-Mail address: ulrike.kahl@gruene-erzgebirge.de She can provide you with a membership application form and other information on how you can help. You can also contact Jason Smith at the Chronicles if you only speak English but still would like to join. It has been a few weeks since my last posting about the Bockau Arch Bridge and the fight against time and the elements to save the 150-year old structure. But as you can see here as well as on the Facebook page (click here), progress is being made in leaps and bounds to have the new structure, built on alignment, ready to go by next year. Already the piers and the concrete decking are in place, and a barrier is in place, permanently blocking access to the old bridge on the north end. Many have written off the old Bridge, however…..
….it’s not over yet. The decision regarding whether the state government will accept our petition and decision to allow for time to claim ownership of the structure before it is demolished in mid-2019 is still out. We’re looking at 4-6 weeks before Dresden decides. Another petition going one level up further is in the making, an alliance to create a bridge association is being formed, and there is ever growing support for keeping the old structure in place, this despite the claims by the communities nearby that they will not take ownership once the new bridge is open. A friend of mine from Pittsburgh gave me this T-shirt containing all of the city’s bridges along the Allegheny, Monongahela and Ohio Rivers before leaving for Niagara Falls during the road trip through the Great Lakes and the Committee Friends of the Bockau Arch Bridge would like to have a Shirt similar like this, but with the bridges along the Zwickau Mulde River. That’s right! We have 40 bridges to choose from, ranging from the Jähn-Brücke at Morgenröthe-Rautenkranz (named after the lone East German astronaut, Sigmund Jähn) to Paradiesbrücke in Zwickau; The Wave in Glauchau to the Göhren Viaduct in Lunzenau; The Bridges of Rochlitz to the Suspension Bridge in Grimma. But the question is which ones deserve to be on the T-shirt? From now until September 15th, you have the chance to vote which bridge along the Zwickau Mulde deserves to be on the T-shirt. Go to the link provided below, which will take you to the Bridgehunter’s Chronicles’ Facebook page and its photo album. Look at the photos selected and like the ones that are your favorite. If there is a bridge that is not listed but you want it on there, comment on it. The votes will then be tallied and the top 10-16 bridges liked on facebook will be placed on the T-shirt. Link to the photo contest here. The winners will be announced on the 17th of September. The T-Shirts will be designed similar to the one on the bridges in Pittsburgh, yet the colors will be different, reflecting on the region in the Erzgebirge (Ore Mountains) as well as along the river. Right now, blue, green and white/grey are being considered, but we are open to other color combinations. Please send an E-Mail if you have a suggestion in colors that you would like to see appear on the T-shirts. Furthermore, as the Zwickau Mulde has one of the highest number of castles, competing with the likes of the Rhine and Rhone Rivers, each bridge will feature a place of interest in the background that is typical of the community. Once the design is complete and the T-shirts are available to the market, orders will be taken with proceeds going toward the Bockau Arch Bridge. You will be notified once the project is completed and available for sale. In addition, postcards, coffee cups, a film about the Bockau Arch Bridge, another one on the bridges along the Zwickau Mulde and a book on the bridges in the region are being considered, but unlike the postcards and coffee cups, which are easy to do, the rest will need some time and planning for them to be realized. But we are starting to like this approach with the T-shirt. While more details are coming, you should really go out and choose your favorite bridges for the T-shirt project. The debate over the name of the bridge! In March of this year, the contract was let to a company for rebuilding the bridge, the name Hirschgaben Bridge was used. However, in the documents on the city’s budget plans was the name Hirschgrund used. This caused a lot of confusion as to how the bridge should be named. On the on hand, Hirschgraben was used because the ravine surrounding the castle was very deep – on the same level as the riverbed of the Zwickau Mulde River- a difference of 30 meters. Geologically speaking is Hirschgraben correct. And according to oral history is Hirschgraben the name used when talking about the bridge and the ravine. Historically speaking, Hirschgrund is also correct as it focuses on the whole complex itself, which includes the castle, park and ravine. In most history books one will find Hirschgrund. Yet given the preference of one or the other, the names of both were both correct, according to multiple sources. Given the need to cross their Ts and dot the I’s the debate on which name is correct was one of the reasons for the delay in allowing the construction to start. The other was the city council’s rescinding of the contract to the first firm in favor of the second because the costs were cheaper and the second one was left out of the discussion the first time around. There had been four but only three officially presented their proposals. In either case, now that the matter over the name has been settled, not to mention the costs and time wasted in “yammering” about it, construction on this natural bridge is about to begin. June is the starting date and the project is expected to take a year to complete. How the bridge will be rebuilt will be presented when the finished product opens to foot traffic for privacy purposes. But it does lead to the question of how this bridge- abandoned for almost five decades- will be reconstructed….. This was the reason behind this pic of the week after my visit to Glauchau. Not to mention to the plea mentioned in the Instagram page: It’s just a bridge! Fix the damn thing for once! Fast Fact: Yammering is German for “jammern” and means simply to complain a great deal like a kindergartner.